Organic Gyokuro Okabe is produced in very limited quantities in the Asahina mountainous area near Shizuoka City and is rarely sold outside Japan. 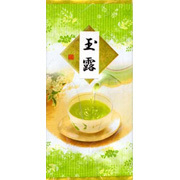 Shizuokatea.com was offered the opportunity to offer this fine Japanese green tea and we immediately accepted. Organic Gyokuro Okabe is grown and harvested in Okabe Town, Shizuoka Prefecture, a pristine area surrounded by immense natural beauty. The area is famous throughout Japan for Gyokuro production and its Gyokuro tea ceremony and tasting rooms situated at Gyokuro No Sato. Organic Gyokuro Okabe has been processed according to the strict guidelines of the JAS (Japan Agricultural Standard) and is certified organic. Brewing instructions are not printed on Consumer (Bulk) packages. Please see the How To Brew page for brewing instructions. 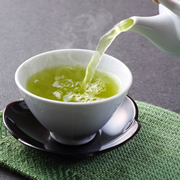 Organic Gyokuro Okabe brews exactly like regular Gyokuro.